This is the biggest shopping arcade running off Kokusai Street with its entrance right across from the Mitsukoshi department store. 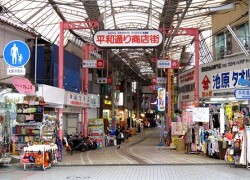 Heiwa Street is lined with a number of souvenir shops and Okinawan cuisine restaurants. There are also grocery stores, drugstores and more retail outlets catering to the locals.